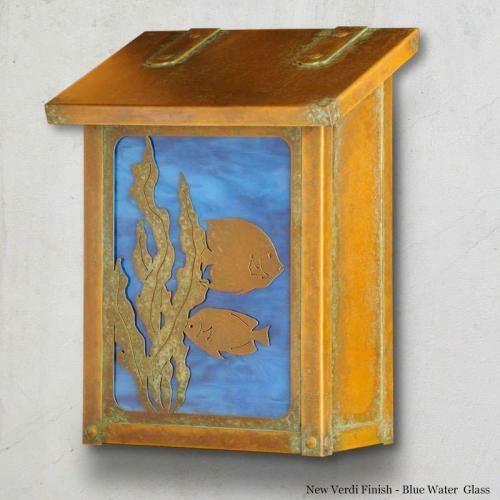 The Fish Vertical Brass Wall Mount Mailbox shown in the New Verdi Finish with Blue Water Glass is a beautiful mailbox - truly a work of art. This is a great mailbox for our friends at the beach! A piece of art glass is mounted behind the Fish design to highlight it. Our Fish Vertical Brass Wall Mount Mailbox is handmade of solid brass - in the beautiful craftsman style - and has a traditional hinge detail on the lid and a rubber bumper inside to eliminate any noise when closing. The corner rivets complete the design and give this mailbox it's rugged handcrafted look. Easy to mount and a wonderful addition to your front entry - the Crab Mailbox will be a delight for years to come. The mailbox is available with an optional patented LED light kit designed to bring light and drama to the beautiful artwork on the mailbox. It only uses 8 watts of power and lasts for 30,000 hours. This LED light kit has a powder coat white finish and can be ordered for either 12 volt or 120 volt wiring. NOTE: THE LED LIGHT KIT MUST BE ORDERED AT THE TIME YOU ORDER YOUR MAILBOX. IT CANNOT BE ADDED LATER TO AN EXISTING MAILBOX. The Art Glass for mounting behind your mailbox design is available in four colors: Champagne, Gold Iridescent, Honey, and Wispy White. Dimensions:Width 9 1/2" X Height 12" X Depth 5 5/8"